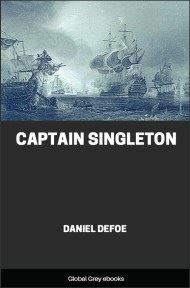 The Life, Adventures and Piracies of the Famous Captain Singleton is a novel by Daniel Defoe. It is believed to have been partly inspired by the exploits of English pirate Henry Every. 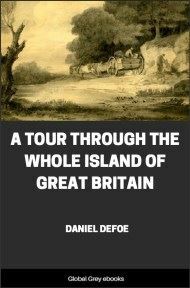 The narrative describes the life of an Englishman, stolen from a well-to-do family as a child and raised by Gypsies who eventually makes his way to sea. One half of the book concerns Singleton's crossing of Africa and the later half concerns his life as a pirate in the Indian Ocean and Arabian Sea. As it is usual for great persons, whose lives have been remarkable, and whose actions deserve recording to posterity, to insist much upon their originals, give full accounts of their families, and the histories of their ancestors, so, that I may be methodical, I shall do the same, though I can look but a very little way into my pedigree, as you will see presently. If I may believe the woman whom I was taught to call mother, I was a little boy, of about two years old, very well dressed, had a nursery-maid to attend me, who took me out on a fine summer's evening into the fields towards Islington, as she pretended, to give the child some air; a little girl being with her, of twelve or fourteen years old, that lived in the neighbourhood. The maid, whether by appointment or otherwise, meets with a fellow, her sweetheart, as I suppose; he carries her into a public-house, to give her a pot and a cake; and while they were toying in the house the girl plays about, with me in her hand, in the garden and at the door, sometimes in sight, sometimes out of sight, thinking no harm. At this juncture comes by one of those sort of people who, it seems, made it their business to spirit away little children. This was a hellish trade in those days, and chiefly practised where they found little children very well dressed, or for bigger children, to sell them to the plantations. The woman, pretending to take me up in her arms and kiss me, and play with me, draws the girl a good way from the house, till at last she makes a fine story to the girl, and bids her go back to the maid, and tell her where she was with the child; that a gentlewoman had taken a fancy to the child, and was kissing of it, but she should not be frighted, or to that purpose; for they were but just there; and so, while the girl went, she carries me quite away. From this time, it seems, I was disposed of to a beggar woman that wanted a pretty little child to set out her case; and after that, to a gipsy, under whose government I continued till I was about six years old. And this woman, though I was continually dragged about with her from one part of the country to another, yet never let me want for anything; and I called her mother; though she told me at last she was not my mother, but that she bought me for twelve shillings of another woman, who told her how she came by me, and told her that my name was Bob Singleton, not Robert, but plain Bob; for it seems they never knew by what name I was christened. It is in vain to reflect here, what a terrible fright the careless hussy was in that lost me; what treatment she received from my justly enraged father and mother, and the horror these must be in at the thoughts of their child being thus carried away; for as I never knew anything of the matter, but just what I have related, nor who my father and mother were, so it would make but a needless digression to talk of it here. My good gipsy mother, for some of her worthy actions no doubt, happened in process of time to be hanged; and as this fell out something too soon for me to be perfected in the strolling trade, the parish where I was left, which for my life I can't remember, took some care of me, to be sure; for the first thing I can remember of myself afterwards, was, that I went to a parish school, and the minister of the parish used to talk to me to be a good boy; and that, though I was but a poor boy, if I minded my book, and served God, I might make a good man. I believe I was frequently removed from one town to another, perhaps as the parishes disputed my supposed mother's last settlement. Whether I was so shifted by passes, or otherwise, I know not; but the town where I last was kept, whatever its name was, must be not far off from the seaside; for a master of a ship who took a fancy to me, was the first that brought me to a place not far from Southampton, which I afterwards knew to be Bussleton; and there I attended the carpenters, and such people as were employed in building a ship for him; and when it was done, though I was not above twelve years old, he carried me to sea with him on a voyage to Newfoundland. I lived well enough, and pleased my master so well that he called me his own boy; and I would have called him father, but he would not allow it, for he had children of his own. 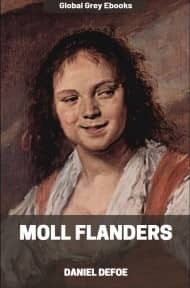 I went three or four voyages with him, and grew a great sturdy boy, when, coming home again from the banks of Newfoundland, we were taken by an Algerine rover, or man-of-war; which, if my account stands right, was about the year 1695, for you may be sure I kept no journal. 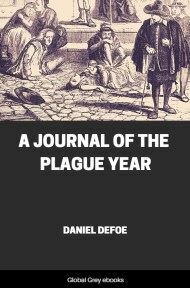 I was not much concerned at the disaster, though I saw my master, after having been wounded by a splinter in the head during the engagement, very barbarously used by the Turks; I say, I was not much concerned, till, upon some unlucky thing I said, which, as I remember, was about abusing my master, they took me and beat me most unmercifully with a flat stick on the soles of my feet, so that I could neither go or stand for several days together. 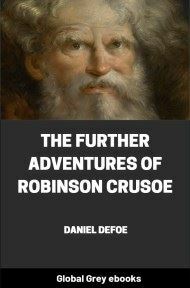 But my good fortune was my friend upon this occasion; for, as they were sailing away with our ship in tow as a prize, steering for the Straits, and in sight of the bay of Cadiz, the Turkish rover was attacked by two great Portuguese men-of-war, and taken and carried into Lisbon.